We already knew it's arriving soon, and Xiaomi has now confirmed that the Mi Pad 4 will be made official next week - June 25 to be precise. The confirmation came in the form of post on the company's Weibo account. Nothing much is known about the tablet on the specifications front, except it could be powered by Snapdragon 660 chipset, feature 13MP/5MP camera combo, and pack in a 6,000mAh battery. No information on pricing as well, but the wait isn't long now. No they didn't , It was sharp that did it first. LMAO. 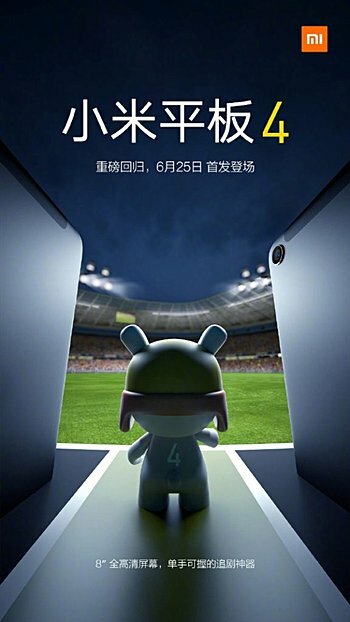 Xiaomi started the bezelless device. Why don't you look for their smartphone pionner and award about the first bezelless? Yeah So , Its OK to make original design and Counterfeit the rest , Cause you want to give your customer a choice as to which first copy they prefer. Do they want a First Copy of sharp , Apple , Samsung. LMAO.